At long last! This is the first challenge where I knew right away what I would make in response. Diane's post: <<Do you remember a scent that evokes vivid imagery? Share that memory with us>>. The immediate response was so clear to me that I rejected it at first, thinking I should come up with something less obvious. So I searched the olfactory memory banks. One of her suggestions was the smell of burning leaves in autumn and that is indeed a favorite childhood memory of mine. And that in turn reminded me of a piece I made many years ago for a local group challenge called "The Elements." I made an experimental 3D piece - a vessel with a side for Earth, Wind, Water and Fire. Here's "Fire." 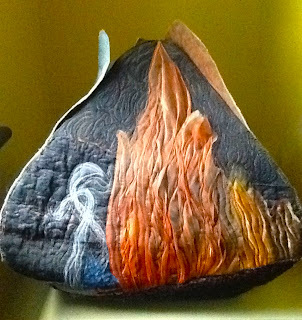 I sat and studied the fire in our wood stove (also a wonderful scent to recall on a chilly autumn day like today) and then layered strips of orange organza and stitched them down. I was not enthralled with the result and stitching in orange to represent the flying sparks didn't do anything to win me over. As I showed it to the group, someone asked, "What sign are you?" When I said, "Capricorn," she nodded knowingly and said, "Yes, of course; that's an 'earth' sign so no wonder you were challenged in the making of 'fire' - they're totally incompatible signs." Interesting food for thought, especially in light of the fact that I had experienced such joy in the construction of the "Earth" side. This recollection helped in the decision not to attempt a piece for this challenge based on the smell of burning leaves from my childhood. Ha! I am greatly relieved we are not expected to depict a specific scent in our next piece. Too reminiscent of that stressful Vivaldi challenge where the artwork was to represent the sound of the music! No, this is a wonderful opportunity to depict the image that comes to mind when a specific scent is experienced or recalled. Like my fellow challenge-takers, I can think of many scents that evoke memories: gardenias, freshly-baked oatmeal cookies, a new box of crayons, Youth Dew perfume.... But I'm back to my original choice. 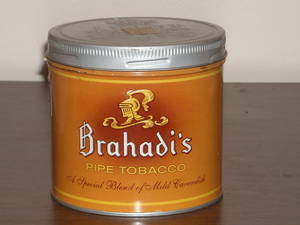 Without giving anything away, I can share this much: Brahadi's Pipe Tobacco is the scent that is inspiring what I am going to create. Can't wait to see the scents and images that inspire my colleagues! Ooo, wouldn't that stretch the imagination....depicting the smell! I like that idea! You're fire is wonderful. Expect your scent will be, too.